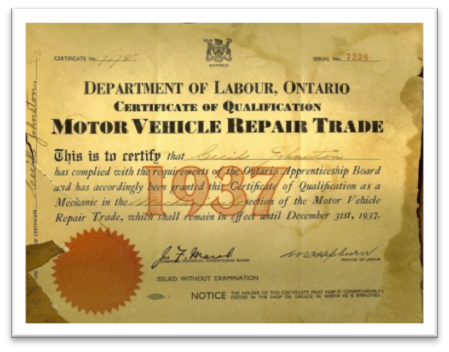 On April 13th 1938, Roy Harman sold his small repair garage and family farm in Holt, Ontario and relocated he and his wife Grace to Kitchener later that month. 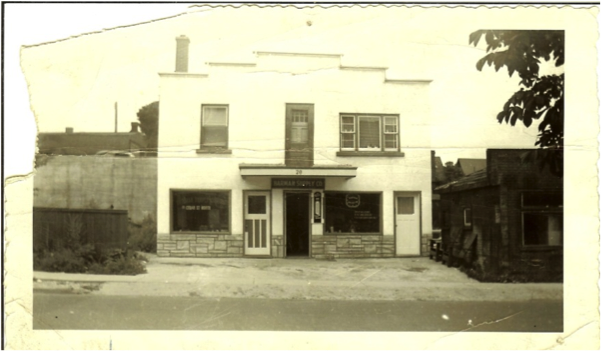 Roy rented a building at 16 Cedar St in Kitchener and opened up Harman Supply Company in the summer of 1938. 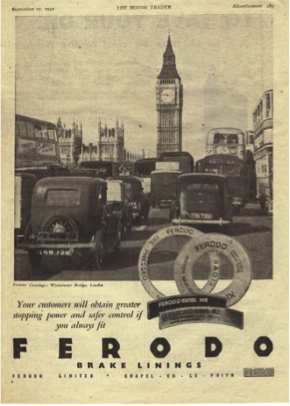 Harman’s started as a small jobber’s business selling Ferodo Brake Lining – a 1st class English Product! At this time Kitchener, or Berlin as it was originally named, was a thriving small community on the rise. By 1940 Kitchener had over 30,000 residents and by the late forties was experiencing major growth. Around the same time Roy Harman was starting up his jobber’s business, another young man by the name of Cecil Johnston was beginning a career in the vehicle repair trade. Without knowing at the time, Cecil would start 4 generations of Johnston’s in the vehicle repair trade, which would significantly change the course of Harman Supply Co. for years to come. By May 30th 1938, Grace Harman began keeping shop while Roy was out on delivery or soliciting business. On occasion Grace even installed Brake Lining on to shoes. In 1948 Roy bought the lot next to them from Thoman Tire for $1800 and began construction of the new building on May 15th. They moved in on Canada Day, July 1st, 1948. After significant growth over a number of years, Roy sold the business to his employees, Ralph Johnston (Cecil’s son) and Gordon Everett in 1957. Business continued to grow at the Cedar Street location as new automotive product lines were added. Roy worked very hard during his 20 years and built a business that was a credit to him. Unfortunately, Roy only enjoyed 4 years of retirement before passing away. 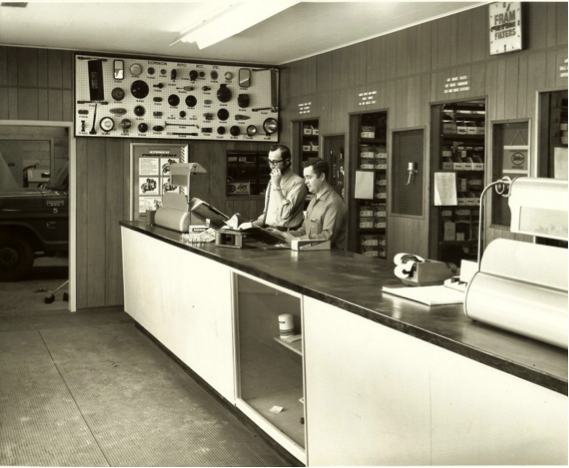 Under Ralph & Gord the business expanded & focused on Automotive parts segment of the business. 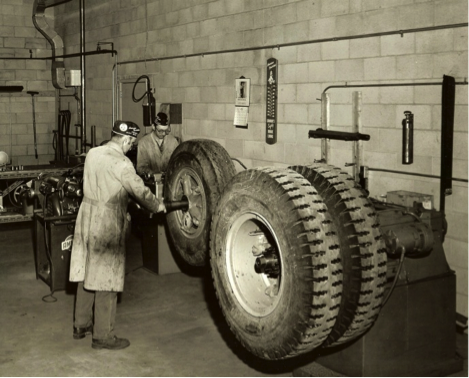 Many new product lines were added to the existing brake business such as clutch & driveline, belts, hoses, lighting, electrical, seals, filters and expanded machine shop services. As both the city and the business grew, Ralph & Gord decided to relocate to an expanding part of town by the new Expressway Hi-way. 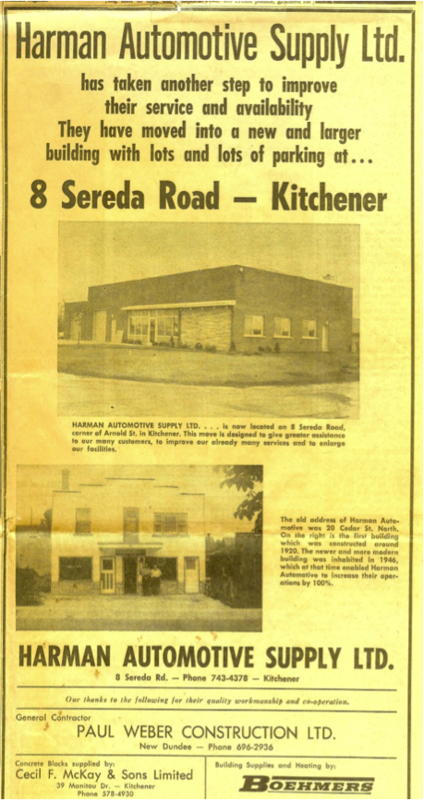 In May of 1969 Harman Automotive Supply moved into its new building at 8 Sereda Road, which is still the home of our corporate head office. Again with added space came increased inventory and further expansion into the automotive parts offerings. 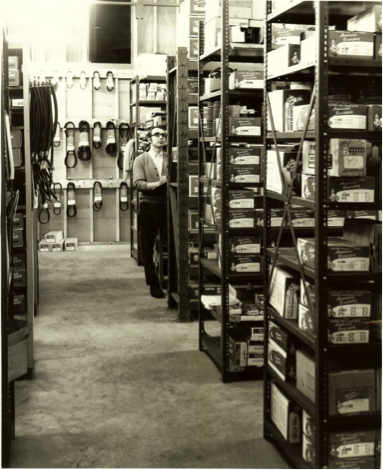 The late 1960’s expansion included numerous new products including: Automotive Clutch & driveline, Air and Hydraulic Brake, Fan Belts & Hose, Lighting, Seals & Wheel End, Filters, Auto Electrical, Shock absorbers & more… Many of these products Harman’s still offers to this day. The move to Sereda road also allowed for expanded machine shop services, expanded sales and increased inventory. 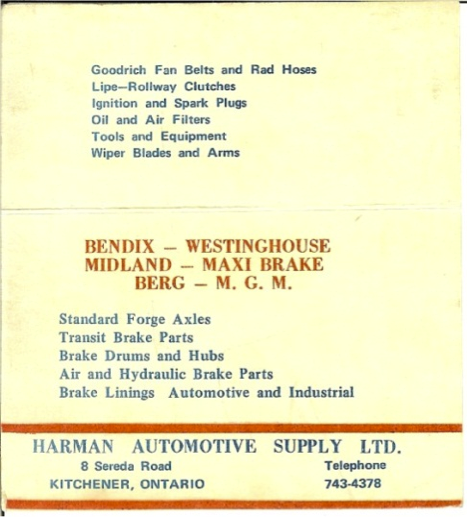 H arman’s grew their customer base over the following years and expanded their clientele beyond the Kitchener trading area. By the 1960’s Kitchener’s population had more than doubled that of the 1940’s and was in excess of 60,000 people. Throughout the 60’s & 70’s Kitchener was one of Canada’s fastest growing communities. Finally, in 1983, Jay and Rob took over the business from their father’s, starting each families second generation in the business. By changing the emphasis from automotive parts to a specialization in heavy vehicle parts, Harman Automotive Supply Ltd was transformed into Harman Heavy Vehicle Specialists Ltd. Under Jay and Rob’s guidance Harman’s continued its’ rapid growth & expansion. 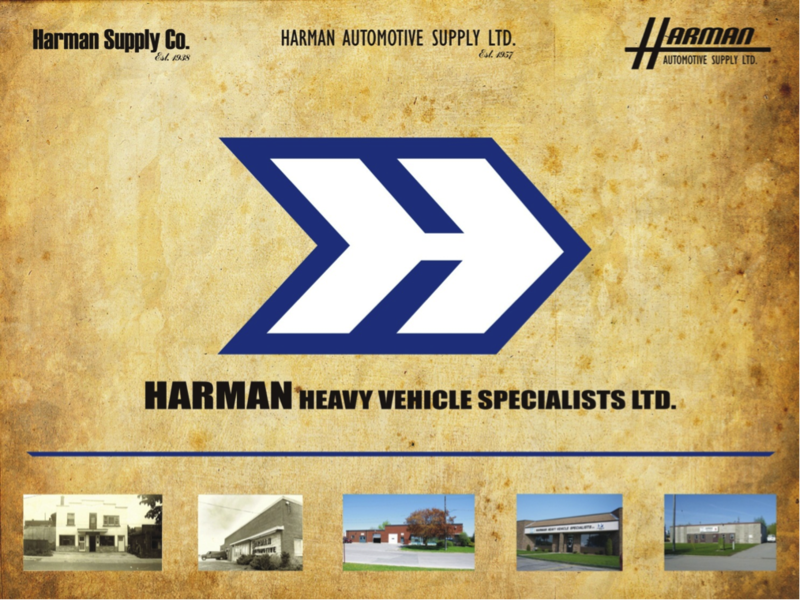 Harman’s management became involved in a number of different industry groups, with Jay becoming president and board member of such as groups the CFS: Council of Fleet Specialists, HDDC: Heavy Duty Distributor Council of Canada (now HDAC), CVSN: Commercial Vehicle Solutions Network and as a result Harmans’ quickly became a leader in the HD market. Harman’s has continued this trend of industry involvement, with Ian Johnston currently serving on the Board of Directors for the HDDC and Harman is the WD host of this year’s annual CVSN HD Industry Summit in Niagara Falls in September 2012. Harman’s continued to expand on all fronts growing our product offering to over 161 different product lines by the early 1990’s. We also continued to expanding our service and delivery and ultimately added two new branch stores during this time in Woodstock and Cambridge. With the expansion of the two branch stores in Woodstock and Cambridge, another expansion was quickly followed with the opening of Total Fleet Service in 1996. TFS is a full service purpose built truck and trailer repair facility with 3 drive through bays capable of handling ‘B-train’ configurations, a full pit and wash bay / small vehicle hoist bay. TFS employees 8 fully licensed mechanics and operates a fully integrated computer system with the Harman’s network, allowing quick and easy parts solutions while your vehicle is being repaired. 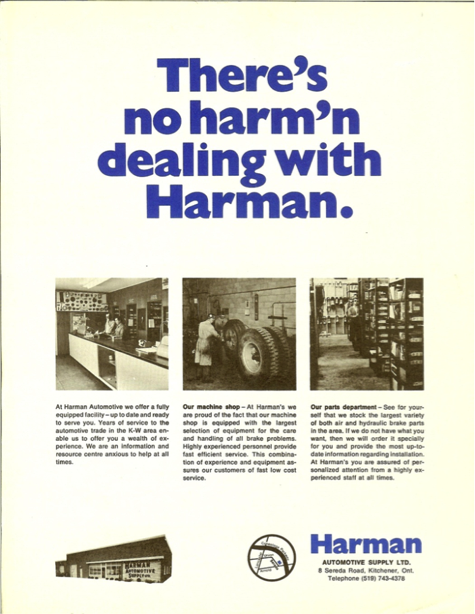 Harman’s to this day continues to expand and be an industry leader in the Heavy Duty parts industry. We have expanded inventory and warehousing, added custom machine shop services, expanded and integrated our stand alone purchasing office to better streamline our parts acquisition, as well as constantly adding new delivery vehicles and expanding our trading area to better service our customers. We continue to remain committed to our customer base by offering the best service in the industry; free parts delivery to most of our customer base, free information seminar nights hosted by industry professionals and remain focused on leveraging technology to better improve our customer service. We work closely with HD Exchange, and are the only HD in Canada currently running VMI (vendor managed inventory)! 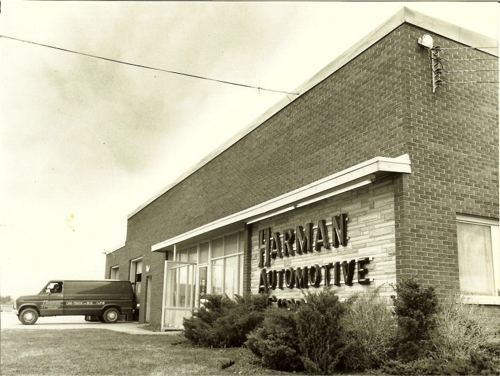 Harman’s has also had a strong community presence over the years. We’ve been in operation in the City of Kitchener since 1938, sponsor two local race car programs with Paul Noakes Racing NHRA Alcohol Funny Car and Cole Weber Racing’s late model Cascar. Harman’s employees also contribute annually to the United Way and have contributed over $20,000 over the past 10 years. 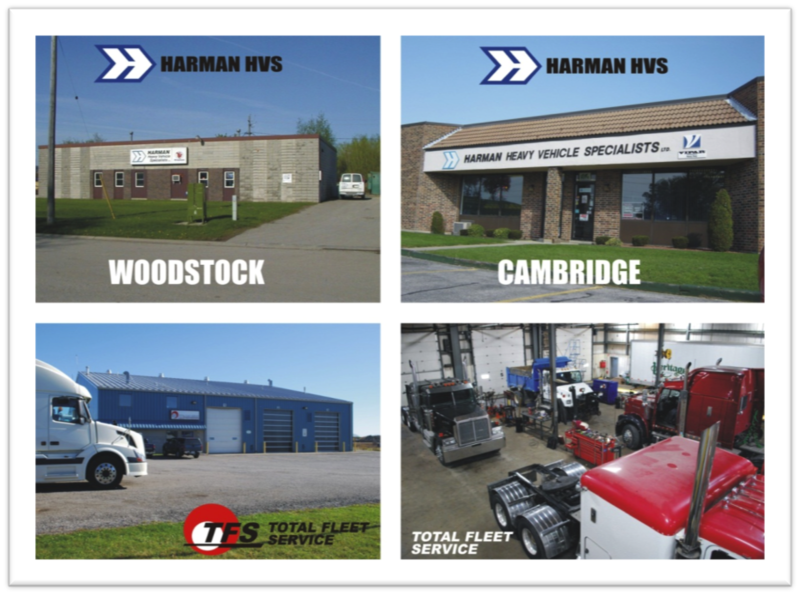 From humble beginnings to industry leader, for everything Heavy Duty, Harman HVS has all your parts needs covered. 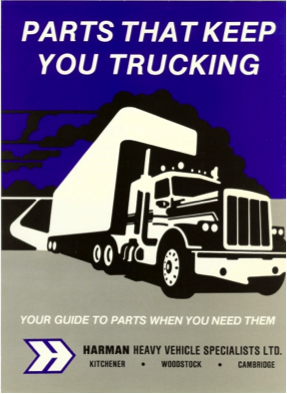 Southern Ontario’s leading Heavy-Duty service provider since 1938.